First off, allow me to apologize. This site has been in existence for nearly two years, and I’m only NOW writing a post about determining slope. Why am I apologizing? BECAUSE THIS IS THE SINGLE MOST IMPORTANT THING EVERY POTENTIAL RINKBUILDER SHOULD DO. This is step one. This procedure should come shortly after “Hey, I wonder if we can build a rink” and immediately before “Honey, can I build a rink?” Your yard’s slope allows you to determine your rink size, how tall your boards need to be, what kind of bracing you can use, how far apart you should space them, how much water you’ll need, and what size liner to buy. When it comes to having the conversation with the wife, you’ll have a higher rate of success if you know how much you’re going to have to spend. Trust me. Once you have these things, you’re in business. Now let’s take a look at your yard. Because I can’t do this for you (unless you’re near NH, of course), you’ll have to be honest with yourself. It seems obvious, but you’ll increase your chances of success tenfold if you try to keep your rink in an area of your yard that is relatively flat and does not have a significant slope. Sure, there are rinks out there with three feet of water in one end and four inches in another, but I wouldn’t advise attempting this unless you’re prepared for the challenges that type of setup brings. Instead, my advice for your first rink would be to find a piece of property with no more than 6-7″ of slope from one end to the other. 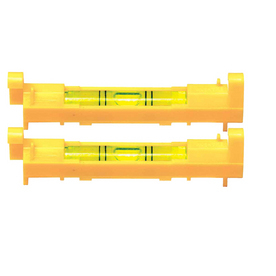 If you’re using 1′ tall boards, this allows you to have 4″ of water in your high corner and up to 11″ in your deep end. You’re going to start by staking out your rink site. Utilizing my advice above, eyeball a flat piece of property and follow some global backyard rink rules: never over a septic tank or leach field, try to stay close to the house unless you can snowblow a path all winter, make sure you have access to a spigot and lighting, and make sure to plan the rink so that errant shots hit your neighbors windows, not yours. Basic stuff. The first stake you should pound into the ground should be your high corner. Every rink has one, and while you don’t know the numbers yet, you should be able to visualize the highest corner. The idea is to plan on having 4″ of water/ice here at a minimum. Then, using your tape measure (the optional longer spool tape measure helps with this step), pound in the other three stakes to create the four corners of your future rink. 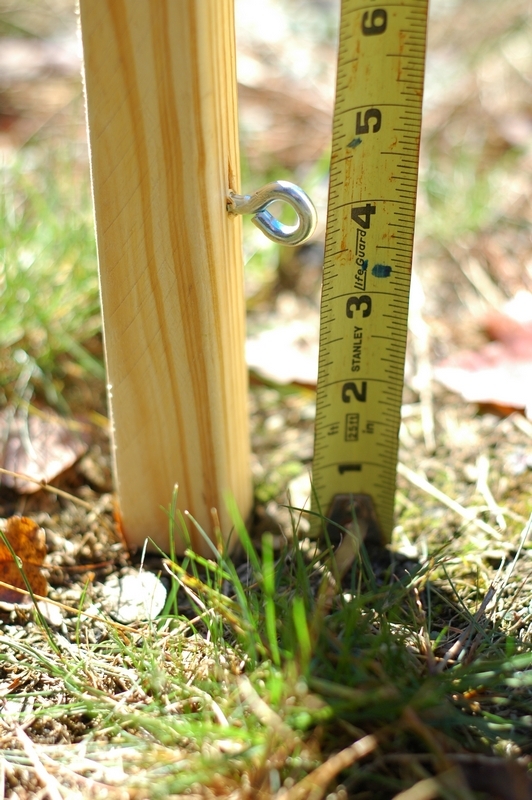 Getting the rink square takes a couple tries, so make sure you check your dimensions each time you add a stake. When I’m doing a site survey for a customer, this is when I typically draw a rough sketch of the rink location and dimensions. You’ll need this in a bit. 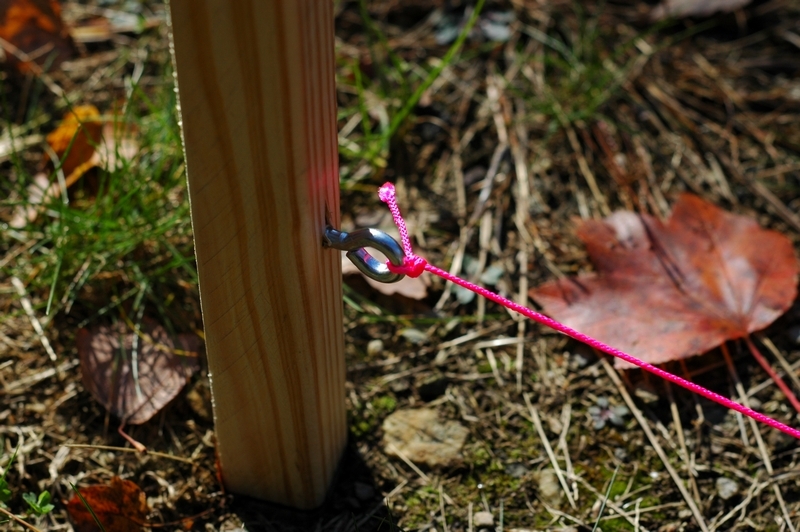 Take your spool of string and tie it around your high corner stake 4″ off the ground. Having someone help makes this easier, but because I sometimes do site surveys for EBR by myself, I attached an eye hook and make sure it’s 4″ off the ground before I begin. I tie the string to the eye hook so I know it’s not going to move up or down. This step simulates the water level at your high point. On the sketch you created above, mark your high corner and write 4″ next to it. Now what you do is grab the spool and walk to any of the other three corner stakes and either attach it to the stake or hold it there. To make this easier when I’m solo, I drilled a series of small screws into my non-high-corner stakes at one-inch increments. 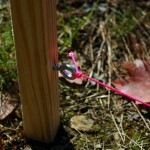 Regardless of method, the idea here is to pull the string taut between stakes so that there is no sag. 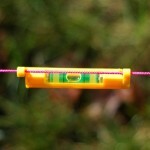 Then you’ll take your cheap line level and attach it to the middle of the string. From here it’s just a matter of moving the non-high-corner string up or down until the bubble in your line level is centered. 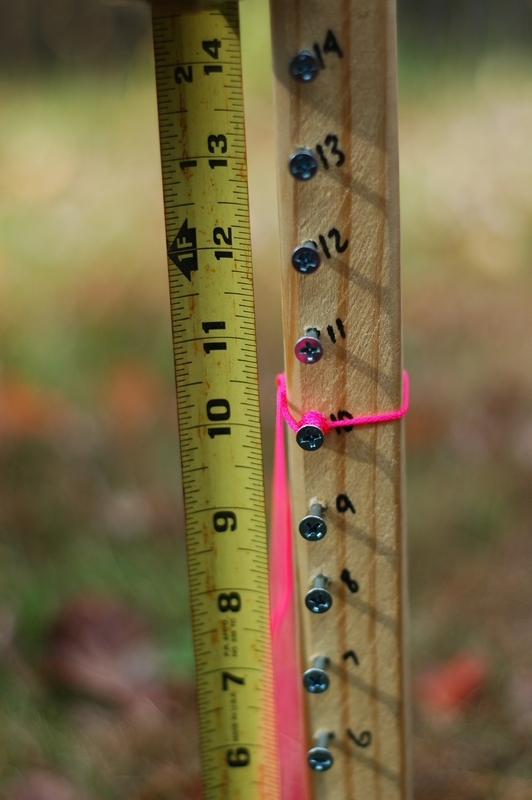 Once it is, take your smaller tape measure and, at the non-high-corner stake, measure how far up the string is off the ground. 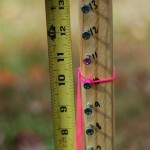 Repeat this step for the other two non-high-corner stakes, writing down the string height at each. Take a look at your diagram. What you’ll have now are board measurements and water heights for each of your four corners. Depending on what your string heights were, you may need to go through this process again. Was one corner 18″? You’ll probably need 24″ boards instead of 12″. Did you have a corner so high it was over the top of the wooden stake? Maybe bring it a bit closer to your high end and try again. Sure, your rink will be smaller, but you’ll have fewer headaches if you can get the water level down. One other note: if your yard crests in the middle of your rink, or if there are any bumps in your yard where the rink will be, make sure you account for this. 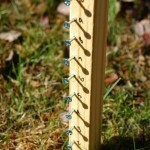 Take one of your corner stakes and go through the steps again to check the slope at the bump. You can aim to have 4″ of ice in your high corner, but if you have a mound in the middle of the rink with only 1″ of ice, you’re going to have problems. In this case, bump your high-corner water level up 3″ to allow 4″ of ice on top of the mound. 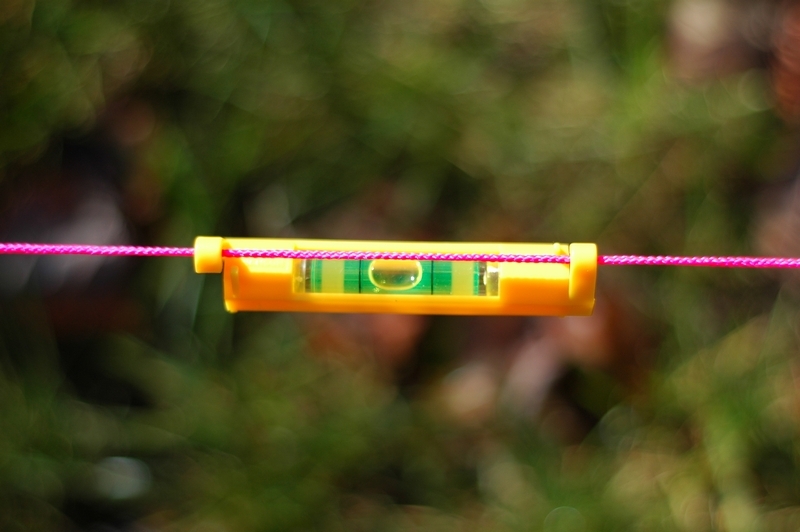 Add 3″ to your corner string heights appropriately. If you’re satisfied with your diagram and rink positioning within your yard, take a few minutes to measure how far your corners are from other features in your yard. Of course, you could always just leave the stakes in until you have your boards and brackets ready, but if that’s not an option, you’ll want a way to ensure your rink is in the same footprint as the four corners you just staked out. 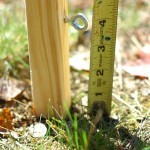 I typically measure the four corners from a non-moving item – fence post, pool, mulch bed, etc. This is certainly not the only way to check level, but it’s now I’ve done it on my rink sites and at customer sites many times. As long as your string is taut and your bubble is centered, this is a cheap and easy way to make sure you won’t commit the single most common rookie rinkbuilder mistake, having water pouring out over the boards at your deep end while the other end of your rink liner is bare. We’ve all done it, or at least come close. But take the half hour to stake out your rink and determine level, and know for sure that you’ll be skating in December. More of a laser level kind of person? Our buddy Alex over at Backyard Ice has a writeup on how to do this same thing using a tripod-mounted laser level. If your yard is undulating or you have the aforementioned mounds here and there, this is the method to use. Joe. In indoor ice rinks (artificial ice) the ice is no more than 1 to 1 1/2 inches thick, max. Why can’t u start at your high point with, say, a 2 inch water level. The frozen ground below will support this. I have made rinks on totally flat surfaces with only about 1 1/2 inch of ice (no liner just packed snow)(have had to do it just on frozen ground some winters due to no snow) and never had a problem. This would allow an 8 inch drop and still have 2 inches to spare on a 12 inch high side board. Just suggestion. What do u think. Thanks for reading and taking the time to comment. Your points are all valid. However, comparing the thickness of indoor arena ice to outdoor ice has some flaws. Indoor ice benefits from constant, consistent environmental factors. There is no sun, no change in temperatures, no pine cones or branches or leaves to worry about. With a backyard surface, a 4″ surface gives you that much more ice to work with when it gets into mid or late February and you’re trying to eke out another skate or two. This also has something to do with location. Being north of me personally, you’re bound to get colder winters that might allow for thinner ice. And I know with my first rink, I probably had about 3″ in my shallow end. Of course, I try to point out with all of my blog posts that there is no singular “right way” to do things. Everyone has their own methods and approaches. For me personally, I try to err on the side of caution, and try to allow for some leeway when it comes to things like ice thickness. Could I skate on two inches in January? Probably. But will that two inches evaporate earlier in my climate than if I were to start with four inches? You betcha. For me, 4″ of ice is spring thaw insurance. Rick I am in Ottawa, so similar climate to you (likely colder, actually) and I would agree that 4″ is best, although you can get away with 2″. Part of it depends on where the 2″ is…if it is at the edge probably not as big a deal as right in the middle. Also, I have read (not seen any scientific proof) that building your ice up in layers on frozen ground (as you seem to do) gives you a stronger product, so maybe you can get away with less thickness. All I can say is the years I have skimped on my fill and only had 2″ in spots they eventually gave me trouble. Great post. I take a slightly different approach to building out my rink (~35’x50′). I’ve got about a 9″ difference between the top edge of my rink and the bottom edge. I run 1×6 boards from the top corner and use a line level to ensure that the top edge is completely level (i.e., at a consistent finished height). 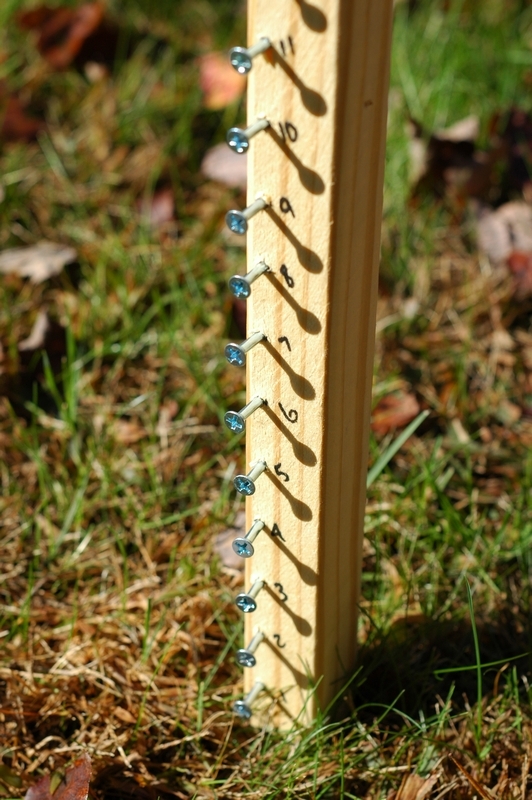 Those boards are fastened to the inside of the stakes. And then I’ll basically put more 1×6 angled on the outside of the stakes to contain the liner. After we get some decent snow, I’ll clear out inside the boards, put the liner in, and fill it with snow that is packed and leveled to the bottom of the top 1×6. Then I’ll build up the ice surface like with a traditional rink but I’m less worried about blow outs because everything eventually gets caught in the liner. Without the snow, the whole rink takes way too long to freeze here in Southern Ontario. The process might sound like a hassle but it enables me to overcome that 9″ difference in only a few days of decent flooding weather. Writing from beautiful Michigan! i have been doing rins for a while and put up a 32 x 72 rink in my yard. I use 3/4 inch plywood and cut the 8 x 4 sheets in half so I have a stack of 8 x 2’s. I put these up on their side so all my hockey boards will be 2 feet tall. I then take a 40x 100 plastic and drap it on the inside and it just makes it over my 2 foot walls and their is my rink. My problem over the years has been not putting enough water. Here in MI we always seem to get a quick thaw in the middle of the winter and my water seems to evaporate. So my suggestion is add more water in the beggining just in case. You guys further north I don’t understand why you don’t put more water for the freeze time should be short.